Furnished studio with equipped kitchenette, living room. 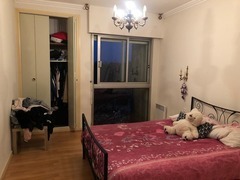 Near train station, on the 3rd and last floor, 27m2 studio in perfect condition, entrance, equipped kitchenette, living room, water, heating and electricity included. Furnished studio with balcony. In perfect state, equipped kitchenette semi-opened on stay, sdd with toilet, double glazing. Studio composed of an independent kitchen equipped and furnished with balcony, big stay with terrace, room.